A few weeks ago I had the honor of taking publicity photos of Glenn Close at FetchDog headquarters in Portland in preparation for her appearance on the Martha Stewart show (which aired 3/17/08). 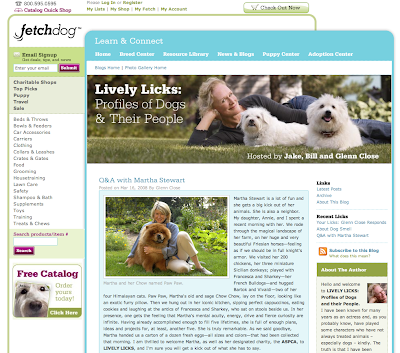 Glenn and her husband David Shaw, founder of IDEXX, started FetchDog last year which is both a printed catalog of dog products, and an extensive website for shopping, researching various dog breeds, networking with other dog owners, and blogs (Glenn's blog below). Walking into the office, the presence of dogs is the first thing you notice! Glenn and Jake, in the conference room. Product meeting in the conference room (her husband David is to her right). Jake has the cutest under bite! A quick snapshot of the staff and their pups. FetchDog has some great things in the works that I can't write much about now, but am very excited to be a part of! Emilie, I was looking for old classmates from Hollis and came across your blog! It is so awesome! I can tell that you have done some amazing things since high school. Wow! That seems hardly an adequate word for your photography, but wow! It seems like things are going well for you and that you are loving life! I am so happy for you and your success. Ha ha! glad i checked the blog today. NICE! Great pics. i can't believe i hadn't seen these yet.